In the U.S. general aviation community, that one word cannot be confused with the name of the town in Wisconsin, or the brand of clothing that bears the same name. Oshkosh is the name of the biggest airshow in the country, held every year during the last week of July. 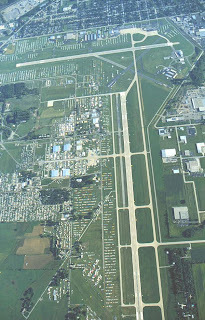 More formally named Airventure, the event is located adjacent to the EAA campus at Whitman Airfield in Oshkosh, Wisconsin. Tens of thousands of pilots and enthusiasts come to see thousands of aircraft that fly in annually. This onlooker is admiring an L39 beautifully painted and restored, flown to the show. Phil made a number of contacts with other museums and enthusiasts who recognized his Cold War Air Museum shirt and made arrangements for future visits and events. again in OSH, I have flown 151 in 1999 with Bill Hawkins from Anoka/MN to Oshkosh and we won the first "Best L-39" award.